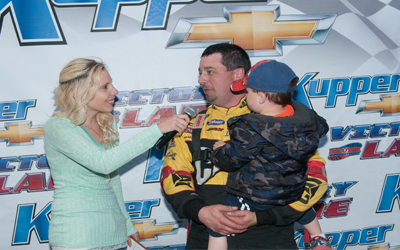 After a week off from racing, drivers and fans returned to the Dacotah Speedway Friday, May 20th. Although a little windy, the track was super fast and super smooth which led to a wide, multi-groove racing surface. The IMCA Sport Compa ct feature kicked off the evening. Stan Thompson started on the pole and quickly distanced himself from the field, however, he over drove turn four allowing Dylan Sandberg and Jason Berg to slip by. A quick caution regrouped the field and on the restart, Berg and Josh Roehrich split Sandberg for the lead. Berg muscled his way into the lead, leaving Sandberg and Roehrich to battle for second. The two young drivers raced side by side until Sandberg was forced to pit for a flat tire with two laps to go. Jason Berg went on to win the feature, uncontested. Josh Roehrich finished a distant second while Chance Seelye edged Josh Houn at the Open Road Honda finish line to finish third. Stan Thompson rounded out the top five in fifth. Josh Roehrich hopped from his IMCA Sport Compact into his Hobby Stock to start on the pole for the Hobby Stock feature. Roehrich had his hands full as Nathan Messer was all over his rear bumper. They briefly raced side by side until Wishek, North Dakota's Brent Vetter made it a three car battle for the lead. Hugging the guardrail, Vetter took the lead on lap four, leaving Roehrich and Messer to continue racing door to door. A lap seven restart brought contact between Roehrich and John Gartner Jr, leaving Gartner Jr spun out on the frontstretch. Roehrich was sent to the tail of the field and on the restart, Vetter and Messer battled for the lead. Messer's highline in corners one and two gave him the momentum to pull alongside Vetter but Vetter's low line in corners three and four gave him the edge to hold off Messer for the feature victory. Gartner Jr finished third ahead of Jesse Foster and Wyatt Rath-Wald. Nate Keena and Tom Wagner batted for the lead in the INEX Legends feature. Wagner grabbed the lead on lap two but Keena rallie d back and they continued to race side by side. A series of quick cautions gave Troy Hoff and Drew Papke a shot at the lead, however, while they raced side by side for third, Donavin Wiest slipped by on the bottom. Wiest quickly reeled in the leaders and took the lead on lap seven. Wiest pulled away as Kenna and Wagner continue to race for second, allowing Papke to catch them and make it a three car battle. They raced three wide until Papke shuffled into second place. 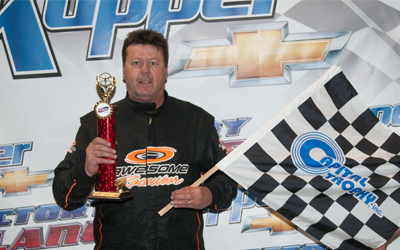 Wiest won by over two seconds over Papke to win back-to-back feature victories. Keena held off Wagner for third as Ivan Sailer finished fifth. Matt Brendel and Nick Desplinter started on the front row in the WISSOTA Street Stock feature. They briefly raced door to door before Brendel cleared Desplinter for the lead. Behind the leaders, Du stin Frank, David Falkenstein and Eric Harpole raced three wide for third. Despite declaring retirement last season, Falkenstein, racing a limited schedule, found speed down alongside the guard rail, shuffling into third. Falkenstein quickly reeled in the leaders, passing Desplinter for second. The low line prevailed as Falkenstein took the lead on lap eight. Brendel kept pace with Falkenstein and rallied back to retake the lead with six laps to go. A caution with two laps to go set up a green-white-checkered restart. Brendel and Falkenstein were side by side on the restart but Falkenstein got loose off turn four. Brendel held off Falkenstein for his first ever WISSOTA Street Stock feature victory. 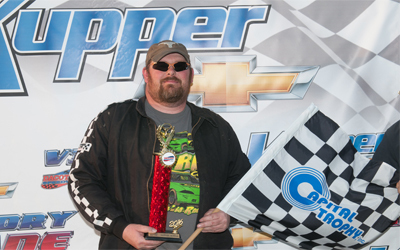 Eric Harpole finished third while Shawn Volk, who spun on lap one, stormed to the front to finish fourth ahead of Chris Michaelsohn. Dickinson, North Dakota's Jay Tooley started on the pole in the IMCA Modified feature. After a series of quick cautions, John Corell of Jamestown looked low under Tooley for the lead but Tooley's highline made it difficult for Corell. 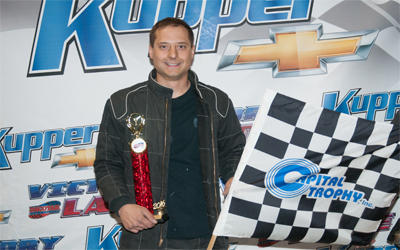 As Corell continued to battle Tooley, Brent Schlafmann had his hands full in third place with Mark Dahl. They raced hard door to door for several laps until Dahl got loose and spun on his own on lap 10. On the restart, Dahl spun again, ending his night early. Corell tried once again to complete the pass on Tooley which allowed Marlyn Seidler and Jeremy Keller to catch the leaders. As the laps wound down, Corell's car began to fade, losing positions to Seidler, Keller and Schlafmann. With 10 laps to go, Seidler had the fastest car on the track and began to catch Tooley however, Tooley found extra speed on the top of the track and started to pull away with seven laps to go. Tooley led all 25 laps to win his first IMCA Modified feature victory at the Dacotah Speedway. Marlyn Seidler finished second ahead of Jeremy Keller. Spencer Wilson and Drew Christianson, who raced their way into the feature through the concy, finished fourth and fifth respectively. Up next at Dacotah Speedway is Military Appreciation night on Friday, May 27th sponsored by RJR Maintenance & Management and Aaron's Sales and Leasing. Military personnel get one dollar off at the front gate. $12 for 13 and older. 12 and under are always free. Advance discount tickets available at select Cenex locations in Mandan, Bismarck and Lincoln. Front gate opens at 6, green flag flies at 7pm.